In a move to facilitate Sri Lankans living overseas to invest in their motherland, the Government of Sri Lanka has decided to embark on a fresh publicity campaign for the Sri Lanka Nation Building Bonds (SLNBB). According to this project patriotic Sri Lankans who live abroad and wish to participate in the nation building process, get an opportunity to invest. These investments in SLNBBs would give them a good return with a Government guarantee. Already copies of a publicity brochure prepared by the Central Bank of Sri Lanka on behalf of the Government have been sent to Sri Lankan embassies in various parts of the world requesting them to organise meetings with the Sri Lankans living in their respective countries. At these meetings the brochures will be distributed and they will be explained of the importance of investing in SLNBBs. The following are the details given in the brochure. SLNBB: Sri Lanka Nation Building Bond (SLNBB) is a new sovereign investment instrument which provides the opportunity for Sri Lankans living overseas to contribute for the economic development of the country. This is a good opportunity for patriotic Sri Lankan citizens to participate in the nation building process through contributing to the future growth and development of the country. Am I eligible to invest in SLNBBs? In what currencies can the investment be made? What is the tenure of SLNBBs? A period of five (5) years. Is the bond tradable/ transferable before maturity? Yes. You can sell and transfer the SLNBB to an eligible investor by registering with the Public Debt Department of the Central Bank of Sri Lanka. What is the interest rate on SLNBBs? * Interest is payable semi-annually at (variable) market rates based on five years US Government, UK Government or German Government bonds, where applicable. * Both interest and principal on SLNBBs are fully repatriable. What else? Any tax benefits? * Interest on SLNBBs are fully exempted from income tax, withholding tax and stamp duty. * You will also be entitled to a duty concessionary vehicle permit if you invest US Dollars 50,000 or more. (20% of the investment value is granted as CIF value, subject to a maximum CIF value of USD 35,000). Is there a certificate being issued for SLNBBs? SLNBBs will be issued in scripless form. However, the Central Bank will confirm the acceptance of your application and Deutsche Bank will confirm the receipt of your investment. Can I hold my SLNBB with a joint holder? Yes. Investors can hold SLNBBs individually or jointly. Interest and principal are paid to the person whose name appears first in the application. Who is the Custodian Bank? Deutsche Bank AG, Colombo is the custodian bank for SLNBBs. It maintains records of all investors and makes payments of interest and capital on due dates. Is there a Lead Manager for this issue? Yes, The Bank of Ceylon will assist to channel money from the patriotic Sri Lankans by deploying a marketing plan. How can I invest in the SLNBBs? Apply now. An application form is attached to the brochures. You may also download the application form from the CD given in the back cover of the brochures or visit the Central Bank website: www.cbsl.lk. When shall I transfer the Funds? You may transfer the funds to our account at Deutsche Bank AG, Colombo at the time of submitting the application to the Central Bank. Please indicate the purpose of remittance as "Subscription to the Government of Sri Lanka SLNBBs". (NRFC Funds are not eligible to be invested in SLNBBs). 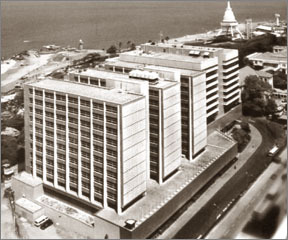 Eligible investors can transmit funds to Central Bank account through the branch network of the Deutsche Bank AG directly or through their correspondent banks or any commercial bank by remitting the funds to the following bank accounts indicating the purpose as "Subscription to the Government of Sri Lanka SLNBBs". Your funds will be mainly invested in infrastructure development projects. The government's vision and action plan for the future, the 'Mahinda Chintana' has identified several key infrastructure development projects. A framework to promote local values: social protection for women, children, elderly and differently able people and vulnerable groups in the society, respect for human rights, and good governance. A community based integrated rural development initiative to empower the poor. An efficient delivery mechanism at district and divisional levels and greater coordination with local authorities to cater to public needs. 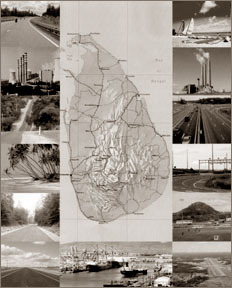 A national infrastructure development initiative (electricity, highways, irrigation, water supply, ports and airports, transport, townships and investment zones) to provide modern infrastructure to promote nationwide regional economic development and create new opportunities for investment and employment creation. Private and public sector participation in economic and social development within a market friendly, export oriented and competitive economic policy framework to complement each other's contribution, maximise value addition, employment creation and environmental protection. An economy based on efficient use of local resources to maximise production of goods and services, for both domestic and international markets, as well as sustained improvements in agricultural, industrial and service sectors with a productive contribution towards economic growth. Macro economic strategies based on prudent budgetary and financial policies to promote savings, investments and to maintain high economic growth within a stable economic environment. The 'Mahinda Chintana' aims at directing the economy to a very high growth path. 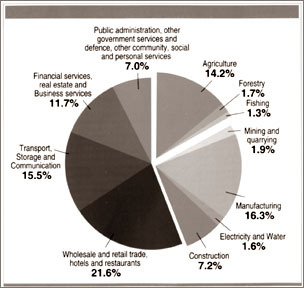 Sri Lanka's economy is dominated by the services sector, with a sizeable presence in industry and agriculture. The services sector includes trade, port, telecommunication, financial, tourism and business services. During the last five decades, private sector industries have expanded rapidly in a competitive macroeconomic environment with the promotion of export-oriented industries. The development of the industrial sector has created a significant number of employment opportunities, particularly in the apparel sector. Sri Lanka is the main exporter of tea, and is the largest producer and exporter of cinnamon, contributing to about 90% of the world cinnamon supply. The country also exports rubber products and is the world's largest producer of solid rubber tyres for off-road vehicles. The economy grew by 6% in 2005, followed by a remarkable growth of 8% in the first half of 2006. 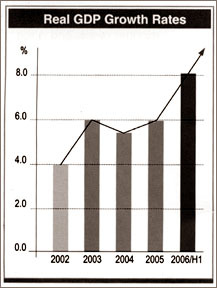 The country's economy is poised to grow by over 7% in 2006, and above 8% in the medium term. Such resilience is attributed to the existence of strong institutional structures and legal frameworks and the high level of human capital development. Sri Lanka has also maintained sound macroeconomic policies, and thereby minimised the country risk. Sri Lanka enjoys a sovereign rating of BB- from Fitch Rating and B+ from Standard & Poor.